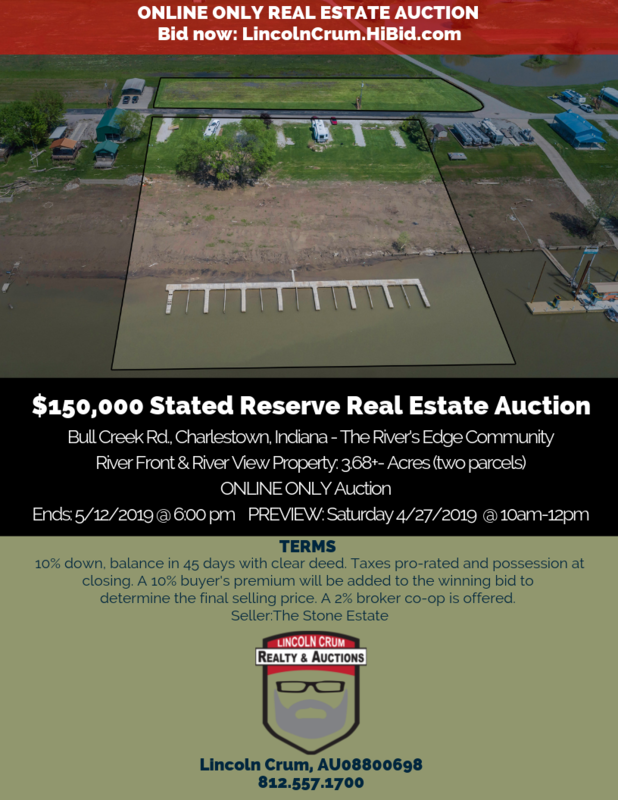 The Stone Estate & The River’s Edge Community TWO RIVER FRONT/RIVER VIEW PARCELS INCLUDED IN AUCTION (Parcel #10-03-05-700-153.000-003 & Parcel #10-03-05-700-148.000-003). GTS 57-58–2.5616 AC & GTS 57-58–1.243 AC. Auction ends 5/12/2019 at 6pm. TERMS: 10% down, balance in 45 days with clear deed. Taxes pro-rated and possession at closing. A 10% buyer’s premium will be added to the winning bid to determine the final selling price. A 2% broker co-op is offered. The property will be offered with a $150,000 Stated Reserve. Once that reserve amount is met, it will be lifted and the property will sell to the winning bidder plus the 10% buyer’s premium, the format will switch to an Absolute Auction and the property will sell to the winning bidder. OPEN HOUSE SATURDAY, APRIL 27TH FROM 10:00 am – Noon. Bidding Opens Thursday, April 4th at 5:00 pm. Bidding Closes Sunday, May 12th at 6:00 pm. Preview is Saturday, April 27th from 10:00 am – Noon.